If half the meat eaten worldwide was replaced by insects (think: crickets and mealworms), greenhouse gas emissions would be significantly reduced and farmland use would be cut by one-third, a new study shows. 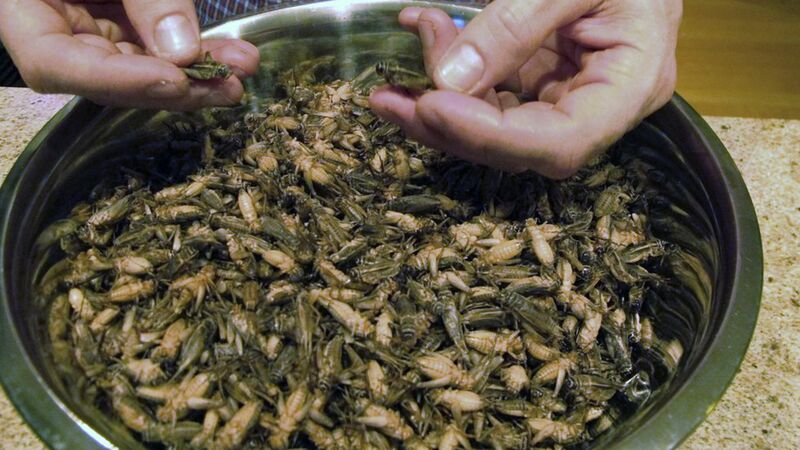 It's a radical new solution for tackling livestock effects on the environment, but the idea of eating insects for sustainability has been thrown around for years. The study: Researchers at the University of Edinburgh compared how conventional meat production from cattle and chicken compared to the process of cultivating alternative meat sources, like insects, lab-grown meat and tofu. They found insects and tofu are the most sustainable and environmentally friendly options because they take up the least amount of land and require the least amount of energy to process. Why it matters: In the US, insects are typically eaten for the "fear factor" or shock value, rather than their nutritional value. Continued research into the benefits of eating insects could change that, help the environment, and provide high-protein, sustainable alternatives to meat. After all, insects are common meals in other countries. What's next: The researchers considered the effects of replacing half of the animal products, like beef and chicken, would be replaced with insects. They estimated that would free up 1680 million hectares of land, which is equivalent to 70 times the size of the UK. The stats: It's been estimated that cattle can account for 75% of greenhouse gas emissions from livestock production. And there are other effects of livestock production: Pasture covers twice the area of cropland around the world, and livestock consume around one-third of all harvested crops, per the study. The solution: "A mix of small changes in consumer behaviour, such as replacing beef with chicken, reducing food waste and potentially introducing insects more commonly into diets, would help achieve land savings and a more sustainable food system," said Dr. Peter Alexander, of the University of Edinburgh's School of GeoSciences and Scotland's Rural College. Flashback: In 2011, a college student at University of Chicago launched a startup that analyzed edible insects and tried to bring them to the market for consumption.